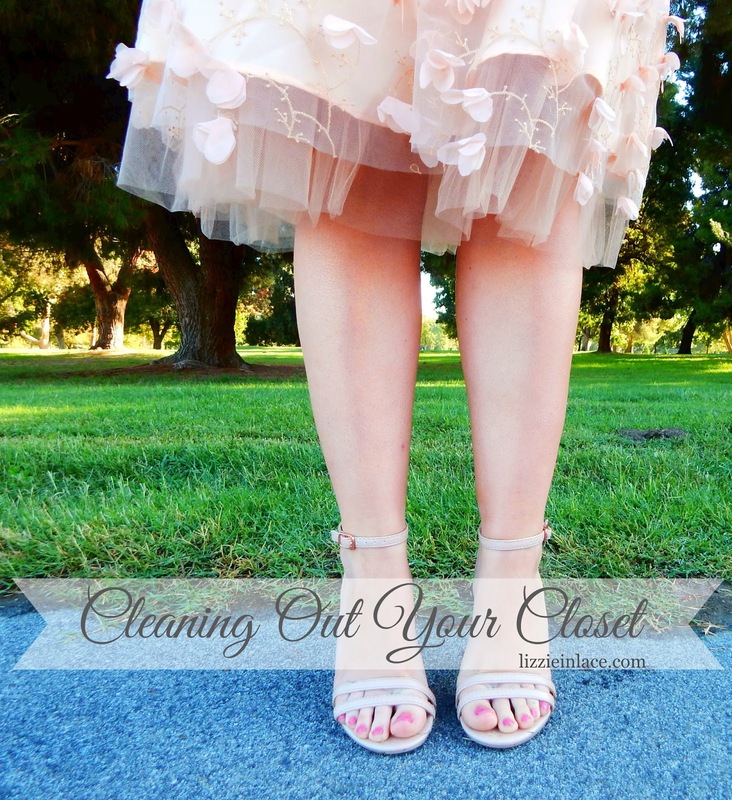 In this post, I will break the down the two steps needed for a successful closet clean out. This is part of my style series, so if you haven’t checked out “Defining Your Personal Style” Part One: The Quiz and Part Two: The Results, I recommend reading those before you start the process of a closet cleanout. With your personal style more defined, you will be able to declutter your closet much more easily and efficiently. First things first, decluttering your closet can be terrifying and overwhelming. Many of us get attached to our clothes for various reasons: maybe it’s sentimental value, maybe it’s because we spent way too much money on it, maybe we use it as inspiration to lose weight, maybe we just keep it even though we don’t like it because someone special bought it for us, maybe it’s for a different personal reason. Whatever the reason may be, clothing seems to linger around taking up space in our closet making it frustrating to find anything or even to get dressed in the morning. Although it may be hard to part with your clothing, we must do it. …literally everything. Try it on…all of it. Every.Single.Piece. Then place each item in it’s designated pile (as discussed in step 2). While you are trying on clothing, keep a few things in mind. *Is it true to my style? *Does it make me feel good? *Have I worn it in the past year? *Are there any stains or rips evident? *Does it make my heart go pitter-patter? Your answers to these questions will help you decide which pile each garment belongs. Be sure not to rush through this process. Mine took about 2-3 days, but it was worth it. You will have five piles to organize your clothing. This is designated for those items that make your heart skip a beat. They make you want to dance up and down the street like Joseph Gordon-Levitt in 500 Days of Summer. These items are flattering, fit, and make you feel good. They are true to what your style is NOW and make you feel most like yourself. After taking the Style Quiz, it was determined that my style was a mix of Romantic and Eclectic with a touch of Bohemian. I would say this is pretty spot on to what my heart loves. Because of this, it was much easier to sort out the things that I truly LOVED aside from those that were just taking up space. On top of the quiz, I wrote down words to describe my style. For each item, I asked myself, “Is this romantic? Is this feminine? Is this “pretty”? Is this true to my style at this moment?” By doing this, it was much easier and less heart-wrenching to get rid of clothing that just wasn’t me anymore. This pile is designated for those things that you LOVE and would, otherwise, be in your I-can’t-live-without-it Pile if it just had something fixed. This can be alterations of any kind…in my case, it’s way too long and I have a pile of things needing to be shortened. Maybe it has a small flaw that you can fix yourself: straps too long, a small hole that is very fixable, some loose embellishments that need to be resewn. Now, you have exactly two weeks to repair these items. If not, they will just sit there an collect dust like they did before. Now that we have honed in your specific style, maybe there are some garments in your closet that don’t currently reflect that. Maybe they are off-trend, maybe they haven’t ever been worn, maybe they just aren’t “you” anymore. Although, it can be sad to depart from your old clothing, it’s something that must be done. This is very tricky and definitely my biggest struggle. To help you determine what to do with your leftover clothing, read on. Our body changes with time. We gain weight, we lose weight. Our body changes shape and what worked once, may not work now. You should not keep items that are unflattering or ill-fitting because you hope to fit in it again or because you can “make it work” some way. Everything in your closet should make you feel good and if it doesn’t, then it doesn’t deserve a place in your closet taunting you (ie. old jeans that don’t button anymore, pants that are so baggy that they fall off your hips, a dress so tight that it hurts to sit down, a skirt that you are constantly pulling down because it’s too short). Save yourself the torture and give it away to someone that will love it and wear it. We all have those moments. You saved up many paychecks to buy the “it bag” only to have it sitting around in your closet unused. Or maybe you found a highly sought after item that was just too good of a deal to pass up. Or maybe you saw someone else wearing that amazing designer coat so you had to have it too. Whatever the reason is, sometimes we make mistakes. Yes, it cost you a lot of money, but it does no good sitting there in your closet unused. If it is still relevant to your style and you love it, why not add it in to your wardrobe rotation? If it’s not relevant to your style, it needs to go. For more expensive items, you may prefer to sell it instead of giving it away. I love using PoshMark and other sites like Ebay, Mercari or even a consignment ship for this purpose and although, you will likely not get back what you paid for it, you will at least get something to ease the guilt. Forgive yourself for this purchase and from now on, tell yourself “no more expensive impulse buys”. Lesson learned. Maybe it’s an item that you try on every now and then and put it back in your closet. Maybe it’s an item that you always skip over when searching for an outfit. Maybe it’s an item that stays in your closet because you have “nothing to wear” and would rather find something in your laundry basket. Here’s the hard truth. You haven’t worn it and you won’t wear it. It’s taking up space. Make someone’s day and give it away. It’s no secret that fashion recycles itself every now and then. Right now, 70s looks are all the rage and I am loving every second of it. With that being said, I probably wouldn’t pull out all of my mom’s clothes from the 70s to re-wear. Although, I do love a good vintage piece….that’s the thing, PIECE. One vintage item at a time. Not a whole outfit of vintage pieces. That’s because even though trends come “back into style,” they’re different each time around. They are relevant to the trends of today and given different silhouettes, prints and details to make them current. They are “inspired” by that era, not completely of the era. You don’t want to look like you walked right out of Woodstock. This is why I would forgo saving everything so that you have it when it comes back into style. Sadly, fashion doesn’t work that way. Give it away. It may be that you have some items that did not make the I-can’t-live-without-it Pile because they are work related and that doesn’t really make your heart sing. However, you do need work clothes so don’t give those away just yet. Think about your work environment. Do you work in an office? A school? A radio station? A bank? grocery store? *(Side note: if you wear a uniform to work, obviously you will need to keep that. )* Your work place determines how casual or how dressed up you need to appear. Of course, you want to be taken seriously as a professional, but that doesn’t mean that you have lose your personal style. I won’t lie. I am not partial to traditional work wear: blazers, suit pants, pencil skirts, white button up shirts…..that’s just not who I am. But when I worked as a bank teller many years ago, everyone else was wearing these items and I was encouraged to do so as well. It definitely was not “me” and I did not feel good in these items. Years later, I kept a few blazers for “interview” looks or “just in case I needed them down the road,” but you know what? My dresses, the ones I feel comfortable in and most like me, are both work appropriate and interview appropriate…not to mention that office jobs just aren’t my thing, so I never needed them down the road. They are now in a box that will be given to Dress for Success. One more thing. Work clothes do not have to be the opposite of your style. It may be slightly different, but that doesn’t mean that you can’t inject elements of your style that you love. Wear a fun piece of jewelry. Carry a bright bag. Polish off your hairstyle with a beautiful hairclip. Wear some amazing shoes. Wear a kitschy button up shirt with your pencil skirt. There are options for bringing your personal style into your work attire…and more than likely, you will be more excited about getting dressed each morning. So even though, work wear might not be completely your thing, you still have to look appropriate. That is not to say that you need to wear things that are uncomfortable or unflattering. If you like it, it fits and is professional, keep it. If it makes you feel bad about yourself, give it away. This is hard. This pile may consist of your prom dress, that old high school sweatshirt, a pair of shoes that your grandma gave you that aren’t your size, a t-shirt from your mom’s 50th birthday bash, etc. Do you NEED these items? No, but we hold onto them for sentimental value. They serve as reminders for our favorite memories and people that we are close to. When we see that item, we remember a certain time, a certain person, a certain smell, a certain song. However, these sentimental items take up ALOT of space and I am guilty for this as are most people. We are afraid that if we get rid of an item, then we will forget about that memory or think it’s because we don’t care and that’s simply not true. Are you wearing these items? If not, give them away. Saying good bye to these items, does not mean you are saying good bye to the memories. You will still have those…forever. An exception would be an heirloom. I have a brooch and necklace from my great-grandmother that I keep. I still have my wedding dress. Those are special to me. I do not, however, have all of the free t-shirts that I got from high school and every formal dress that I’ve ever worn. Is it stained? Does it have unrepairable holes? Does it smell funny? Throw it away. In the trash. It is not suitable for the giveaway pile or for your closet and although, it may hurt, just rip off the bandaid and you will forget all about those old, raggedy clothes that you’ve had since 2005. It was a good run, but now it’s time to move on. We all have those items that we just don’t know what to do with. They are the “maybe” items. You still like it and it fits. It could be relevant to your style. But you just don’t wear it very often. What I suggest doing is keeping these items in your closet for a month or two. If you still don’t wear them but just can’t part with them yet, put them into a box and put it away. If you haven’t reached into the box at least once after a month or two to grab an item, it’s time for them to go. Take your box elsewhere for donating, but don’t open it. Opening it will only make the pain worse and entice you to keep these items. Chances are that you have already forgotten what is in the box and this will make getting rid of these items that much easier. I know that cleaning out your closet can be a scary thing. I clean out my closet once a season, but it is VERY hard for me to get rid of clothes. This time around, I did it and it feels great. My closet is not as confined and I can actually find things that I’m searching for. I love all of the garments and they are very much true to my personal style. The best part is that I don’t have things taking over my apartment. I feel less stressed out and more relieved that it’s done. My clothes went off to good homes where they will be appreciated, loved and WORN. You closet reject may end up being the new owners favorite piece. You may brighten someone’s day by giving them something that they need (that you didn’t). How special is that? Pat yourself on the back. You made it through the dreaded closet cleanout and survived.